The roots of St. John’s Evangelical Lutheran Church in Creagerstown were laid in the nearby and now lost settlement of “Monocacy” where the earliest Lutheran and Reformed congregations formed in the late 1730s or early 1740s out of the ministry begun by John Casper Stoever. Though many of the parishioners eventually moved from “Monocacy” to Frederick-Town, others remained in the area. Because the old “Monocacy Church” became in disrepair over the years, Peter Apple deeded an acre of land to three men for use as a schoolhouse in present day Thurmont; a few miles from the now long lost “Monocacy Settlement”. In 1768, the three grantees re-deeded the same one-acre land tract for the erection of a schoolhouse and church, now known as Apples Church. As the population in the area continued to grow, about six miles to the south of Apples Church, but within the area of the “Monocacy Settlement”, John Creager laid out a new town about 1779. 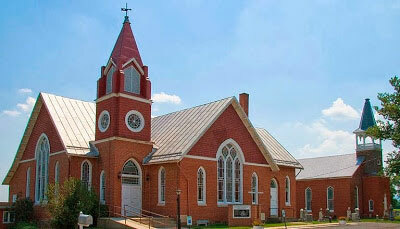 A Union Church of Lutheran and Reformed congregation was established in what was now known as Creagerstown by 1787. Here a church was built, and in 1789 a church register was opened. The Lutherans and Reformed congregation shared the same church register for many years but the Reformed element had always been in a minority and eventually disbanded over time. Today, St. John’s Evangelical Lutheran Church in Creagerstown maintains a thriving congregation that serves both its communicants and others in this part of Frederick County.